The CT 1402 Card Reader side got a lot of attention, again. The rollers were reworked and replaced in November, now there is a clutch latch problem that wasn't there before. but then the mystery started, what is going on in there? John check his schedule on one of those mysterious pocket things, and promised to show us the planning displays of the coming formal museum next Wednesday, very early afternoon. There was considerable tape rattling using the DE 1401. Allen and Glenn were up to something. Someone had e-mailed asking for sample printout from our 1403 printer to help reconstruct an old auto advertisement. click for expanded size Life got interesting trying to explain those round dots in/near the characters. If they are caused by the ribbon, the ribbon moves vertically - should be different dots each separate impact !?! therefore more dots for more impacts.We are open to comments. A day later, Stan forwarded the one resulting font. Two other font images were included, one "heavy", and one "light". Much ado about nothing. I've always felt that letters were to communicate with - and that the upper case only 1403 FORTRAN font was just fine for everything - just kidding, I think. Ed and I had this discussion earlier in the week. The sample I sent jay had 5 lines. Line 1 had single ; Line 2 double print....;Line 5 was hit 5 times. Even line 5 had distinct dots. Since the ribbon was moving, the highs and lows of the ribbon would not be the same each time. The only solution Ed and I came up with is that aliens did the actual printing. We last worked on the CT system 3 weeks ago. The "Skew Error" problem that we saw then was back today. We traced the error to the Emulator. It was dropping "Ready" too early. I don't know why we didn't see this problem on the German system. We delayed the drop by 400 uSec and the error disappeared. Hand entered magnetic tape read and write loops work. Present were: Ron Williams, Bob Erickson, Bill Flora, Frank King, Allen Palmer, Glenn Lea, Joe Preston, Stan Paddock, Ron Crane, Ed Thelen and Robert Garner. Kirsten Tashev and Dag Spicer of the museum staff smiled as they came to visit us. The timing was fortunate - everyone was looking busy!! I told them that we are just like puppy dogs, we like to have our heads patted. (Added Dec 22) - J�hann Gunnarsson, of Icelandic "IBM 1401: A User's Manual" music fame, has identified the tune as "Wheels". He e-mails " It can be found in various versions on Youtube, for instance performed by Chet Atkins: http://www.youtube.com/watch?v=YzL4ntNwpH8&feature=related"..
One can say "1403 Chain Printer Music"
which is an even a less lovely name than "Chain Printer Music"
- and probably many categories I have forgotten"
"Regarding descriptive names for this kind of music, I have always connected it with the magnetic core memory. The music pattern, pitch and length of notes is after all controlled by what is going on in the memory. "If I remember correctly, in order to get best results we used to put the AM radio right on top of the memory module. I vaguely remember that we could hear RFI noise from the IBM 1620 as well, although we never really tried to find out how to play it. 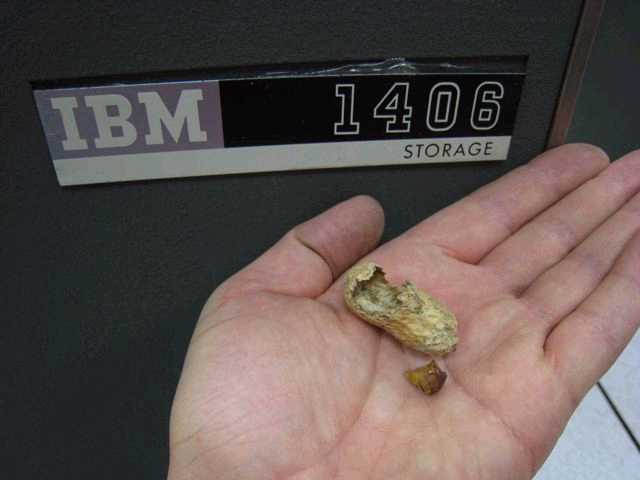 "In my opinion, 'IBM 1401 memory music' is quite a descriptive name for this phenomenon." A major source of the Radio Interference is likely the core memory. To make our "coincident current" core memory work, two sizeable currents ( X and Y currents, about 1/2 amp each) need to be started and stopped suddenly. These take large paths in the core memory area (useful to radiate magnetic pulses efficiently). The IBM 1620 at Computer History Museum had its memory in a temperature controlled metal box (a long story). The metal box likely shielded much/most of the RFI that would otherwise escaped to be received elsewhere, like by radio near the memory. Ron Crane reminds me of C.T. Winter at General Electric Computer. Charlie never hurried, was never slow, (like a bull dozer driven by a pro.) He analyzed carefully and thoroughly, any changes documented carefully and completely, and when he fixed something, you had confidence it was better than new and could never be troublesome again! The panel lamps of "our" 1401s have never worked visually well. Some adequately bright, some faint, and some you cocked your head, squinted at, and more or less said it looked ON (or OFF). And some of the control buttons were not back lit at all - giving a ragged appearance. Ron Crane apparently decided to "Make Them Right". Some of the indicator lamps could not be pushed in all the way. The sockets behind some of the control buttons were distorted/mashed so that no lamp could be installed. Ron made this document clarifying the correct lamp to use for the indicator bulbs. And a picture of the correct lamp. (The reamer at the bottom will be discussed below. Unfortunately, the current production of this lamp, especially from "off-shore" is a few thousandths over size - sometimes making a too snug fit in the plastic two part holders, especially if mis-aligned or incompletely de-burred. The incorrect replacement bulbs were slightly undersized, and fit well into the German (DE) 1401 lamp holders. Tungsten resistivity is 52.8 Ωm at 20 °C, however as temperature increases, also does resistivity. R -Resistance of tungsten filament when hot. Temperature -average temperature of filament. There are hot spots near the middle and cool spots near the support leads. 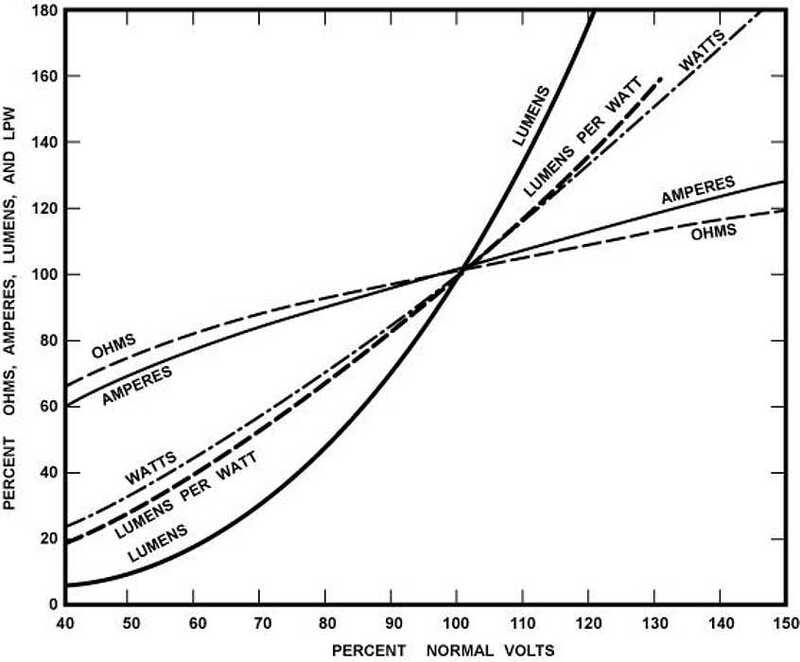 output vs. watts from http://www.sylvaniaautocatalog.com/new_sylvania/vwd_justso.htm. The job's not done until the paper work is complete? Ron Crane and Ed Thelen continued on to 7:00.
worked on German #1 � problem was failing to go into hi-speed rewind. Found that there is a thermo-interlock in the circuit. Took awhile where it was, it is on the outside of the hi-speed motor against the windings. Removed the motor but there is no way to replace the switch. Tapped the switch capsule �gently� with a hammer and the bi-metal strips released. Reinstalled motor and hi-speed rewind function now working again. Ed has a picture to add to the report. We fixed a bug in our Autocoder tape copy program that was writing accidentally very very long records. It turned out that just bit 4 in the hundreds digit was not getting reset. We replaced that STAR card and the problem went away. Define tape drive 1 to map to the PC object file that we wanted to boot and run. The program was a tape-to-tape copy program that copied records from drive 4 to drive 5. Define tape drive 4 to map to the PC text file to be copied. An ASCII text file that contained only legal BCD characters. Define tape drive 5 to map to a scratch file on the PC. Press the "Tape Load" button to successfully load and execute the program. The CT 1401's tape subsystem is now "mostly working". There are several things that we haven't checked out yet (odd parity, backspace, etc. ), but there are diagnostic decks to test these functions and it would be inefficient to try to check these functions out without a working card reader and printer. So, we are going to turn our attention to improving the stability features of the emulator. It has problems with records of more than 1000 characters. We need to make some changes to make it operate with its maximum 2048 character records (PIC RAM limitation). The "Load Rewind" button on the virtual operators console does not rewind a virtual tape that has been previously read or written. Under some circumstances closing a virtual tape drive causes the web application to crash. The other operator controls need further testing (tape density controls and tape indicator status). We also want the Emulator to work via wireless intranet from a student's notebook computer. We were able to run the Emulator today wirelessly from my notebook computer, but it would be easier if certain changes were made. Jeff will publish a request for CHM IT actions to simplify this connection. Bob forgot to mention the successful testing of the new optical interface between the tape emulator and the 1401. Photos attached. Ron Williams is spraying? some of this secret sauce on a 1403 printer ribbon. Rumor has the recipe of this jungle juice is 2/3 "mineral spirits" an 1/3 regular motor oil. Ron says his lawyer has looked into all Ron's contacts and firmly denies any wrong doing, in spite of rumors of carbonized bat wings and toads. The theory being that the ribbons already have enough black die (carbon??) in them, but need more liquid. The following pictures were taken several weeks ago - see here for the start of the action. to have the expanded material removed, leaving a cylindrical roller of original dimensions. And here is the "after" picture. Apparently the cards moved more smoothly and remained better in line after this roller treatment. But - now there are apparently electrical or logical problems preventing proper card reading using the CT machine. First, using the CT System, we verified bug fixes that were developed over the last week. We were able to successfully write and read 2000 character records between the 1401 and the Emulator. We verified that he "Load Rewind" button on the virtual operator's panel really performed a rewind. We were able to close() virtual tape drives from the emulator without crashing the Emulator. However, once all the tape drives have been closed, we can not reopen a drive without reloading the driver. More work needed here. The "Load Tape", "Tape Read", and "Tape Write" operations on this machine are stable. The Tape-2-Tape copy program works first time/every the time. We found and fixed a bad card in the TAU R/W Reg parity tree. We can now successfully run "Move Tape" and "Load Tape" diagnostic programs again. However there still seems to be a problem with multiple consecutive Backspace operations. When a program performs four, only two seem to be performed. ??? While we were working on the German System, the smell of burning electronics started to fill the computer room. The odor was coming from the CT 1406 Storage Unit. We found that the the Fan Circuit fuse (F7 in the 1402) had blown and all the fans on the CT system had stopped. The whole system was overheating, but the 1406 seemed to bear the worst of it. While we were searching for the root cause, we dissembled and examined the 1406 fan assemblies. In one of the assemblies, between the fan and the top row of cards, we found a roasted peanut shell (photo below). We are not sure if the peanut was pre-cooked or slow roasted over the years by the 1406. We removed the shell and replaced the fuse. The 1401 powered up and ran OK. However, we did not have any programs that would test the 1406. We will resume testing on January 8th. Merry Christmas & Happy New Year to all. When we resume, we will move the Emulator back to the German System. We are ahead of the 1402 and 1403 bring-up. More advanved bring-up of the CT Tape Subsystem is inefficient without a functioning printer. Worked on the German #2 drive. 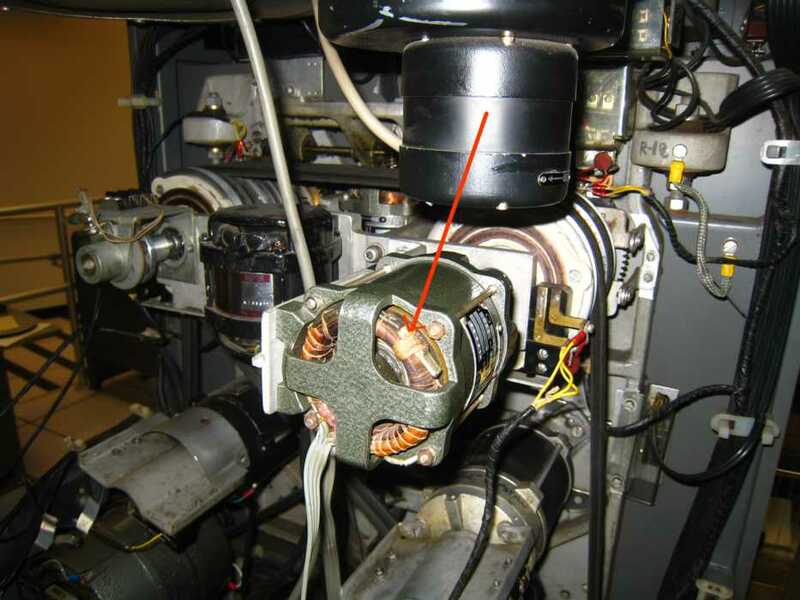 The �supply-side� capstan motor was making some bad noise.. pulled and replaced. Problem solved. When pulling out the capstan motor noticed that there was fine coat of gray powder. It was from the rear clutch unit. Not sure if it is problem (a steady leak of magnetic powder) or just a �break-in� temporary problem. Will watch and if necessary will have to pull the whole clutch shaft & replace it. Hope not to. The drive is now fully mechanically operational. Full mechanical and program control from TAU panel and Main Frame programs to both drives. Please note. I will not be coming to ��work� �on Wednesday since all mechanical work is finished and now �read/write� debug which is best done on Thursday with emulator team. I do ask that from now on nobody try to fix any problems that come up either drive. Just either call me/send an email or leave a note on the machine and I will fit it when I come in. Reason is that I want to have one-person maintain the drives from here on until we have them running perfectly. Ron Williams, Bob Erickson and his son Dean, Bill Worthington and Mike Cephonis all came in today. Bob brought in a Teletype ASR 33 like mine. It belonged to his neighbor. I spent some time on it and got most of it working. He also brought in several, never been used, ribbons for the TTY. They are dry. We have at least a dozen rolls of paper tape and 5 boxes of fan fold paper tape which I gave to Mike. His PDP1 uses that stuff. The CT machine is really acting funny. Put the machine in Alter and store a byte and the printer prints a line of that byte. 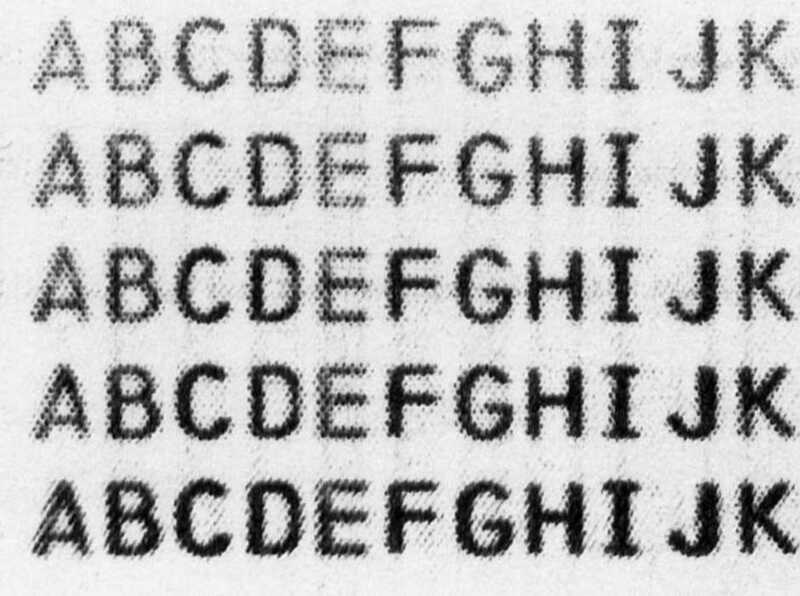 (byte = BCD character) That byte is not in the print buffer. I am not sure, but I think the machine had a stroke coming from the East coast to California. There is a possibility that the problems with the printer and the card reader may be related. Of course, there is a possibility that Elvis is still alive. Bill Worthington and I ran my simple tape test of 729 #1 of the DE 1401. As in the last try, the error count was appraching 50%. Bill said "Have you tried a new tape?" We took a tape from the back rack and put it on. It appears that the DE #1 79 is ok. I am headed for Carson City in the morning. I will be back in the shop on Wed the 7th, the good lord willing.